Don’t keep the fish, or the dockside dollies, in the dark—install underwater lights. My idea of fishing is telling the sushi chef what to put on my plate. But anglers of my acquaintance say the best way to land a fish dinner isn’t by chatting up an itamae, but by lighting up the ocean: An underwater light sets up a handy little food pyramid—it attracts plankton, followed by hungry baitfish and other marine critters intent on dinner. Finally, game fish drop by to enjoy a bite, too, eventually grabbing something with a hook in it. If you’re a night-owl angler, and you’ve not yet rigged up some underwater lights, now might be the time. But underwater lights aren’t just for fishing. Mount an array on the transom and you’ll spot floating dock lines or debris when backing into your slip at night. The soft glow of an underwater light near the cockpit steps shows debarking guests just how far it is between boat and dock, without killing their night vision in the process. Search-and-rescue teams use bright-white underwater lights to locate objects below the waterline; they work much better than spotlights since there’s no reflection off the surface. 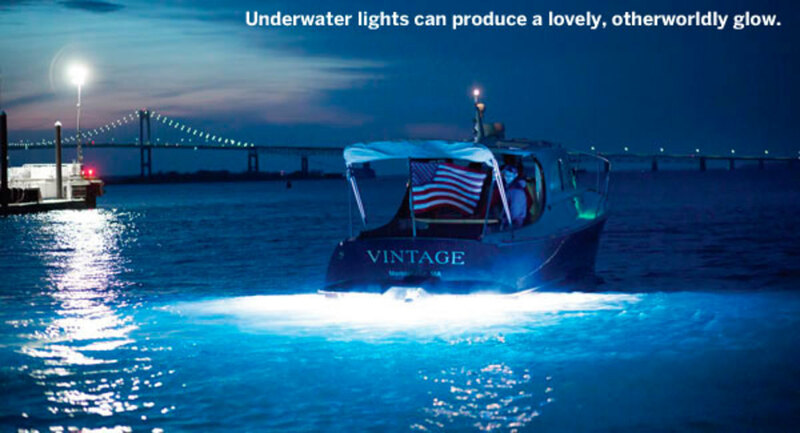 Indeed, underwater lights have become so popular that, in 2015, the National Marine Electronics Association (NMEA) added an Underwater Lights category to their Products of Excellence Awards. The winner? Lumishore EOS. But maybe you don’t care what’s under the boat; you just want to look cool, or “fish” for dockside dollies hunting for an invitation to come aboard. Whatever your reason, there’s an underwater light for you. In fact, there are a lot of underwater lights, in a wide range of sizes, styles, and colors. 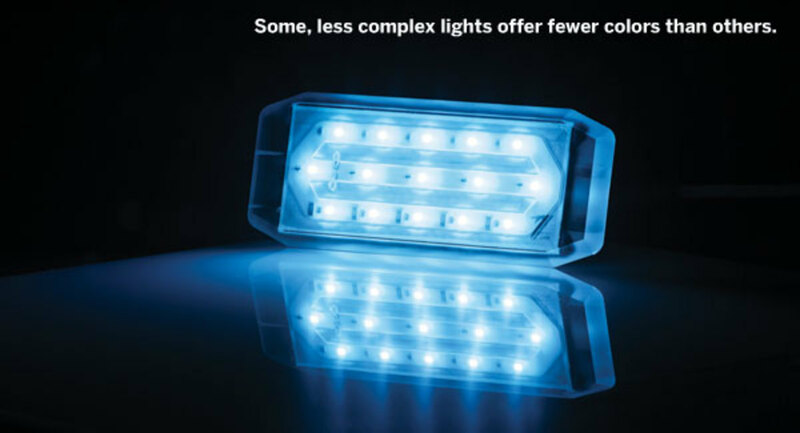 The prices range widely, too, from under a hundred bucks (West Marine’s Underwater Puck Lights cost about $60 apiece) well into four figures: Aqualuma’s top-of-the-line Gen 4 18 Series lights (considerably more expensive than the Aqualuma Gen III 3 Series lights we intalled on our project boat Arawak...seeBrighter Days Ahead, from the September 2015 issue of Power & Motoryacht) run to more than $1,500 each. And most boats require more than one light, so cost can be a major factor, too. To Bond—Or Not to Bond? 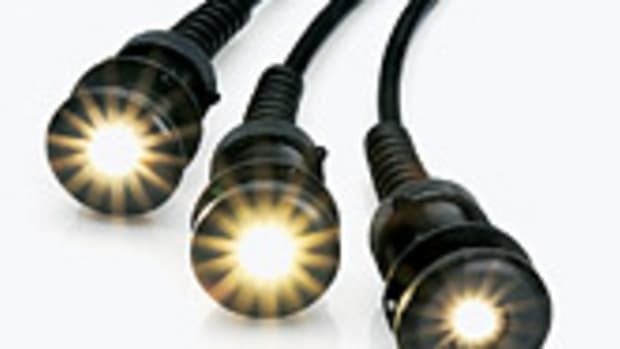 Some underwater lights live in bronze housings, which most manufacturers recommend connecting to a boat’s bonding circuit. Generally, the ABYC also recommends bonding metal underwater fittings in fiberglass hulls. Some experts disagree, saying that if an underwater fitting is electrically isolated, bonding is not only unnecessary, it creates galvanic issues where none existed. If you have a wood or metal boat, the question is even more complex, and plugging into shore power can create even greater problems—although bonding helps prevent electric shock from errant AC, too. Lumitec makes surface-mount underwater lights in both bronze and aluminum housings. The installation instructions say not to bond the lights. An engineer at the company said that poorly engineered bonding systems aboard a boat, or stray current in the water around said boat—a common situation in marinas—can result in corrosion in bonded fittings, but won’t affect unbonded ones. Rather than go with bonding, Lumitec provides fasteners—silicon bronze for bronze lights, chrome-plated stainless steel with insulating shoulder washers for aluminum—that won’t react galvanically with the metal housings of their lights. I asked an ABYC technical specialist about this. He said ABYC standard H-27 applies to “through-hull pipe fittings, drain plugs, and seacocks,” but not through-hull transducers and underwater lights. Anything electrical would fall under Standard E-11, he continued, but there’s nothing specific for underwater lights there, either, and the ABYC bonding recommendations are for through-hull fittings intended for water flow, not “energized thru-hulls.” The specialist recommended following the manufacturer’s instructions. My advice? Consult with a certified galvanic corrosion technician. He can check your situation, test your bonding system, and locate stray currents around your boat. It’s cheap insurance against corrosion. If you just want to fish, hang a simple portable light on a line off the transom. This will work fine for angling, but rates zero on the coolness scale. You can buy an AlumiGlo LED light for as little as $100. It’s not fancy—it looks like a light saber without the hilt—but requires no installation: Just clip the leads to a battery and lower it over the side by its 25-foot cord. Does it work? Heck, it’s a light, it’s green (white is also available), and it’s lots brighter than dark water. I don’t see how fish will know you’re not using a more expensive product. Most folks will want something a little nicer. Seaching the Web for “underwater lights for boats” will take you to the major players (Or check out: Shopping For Lights? below). You’ll find lots of pictures showing products in action, and you’ll see the light patterns of different models—some lights have narrow beams, like spotlights, while others are floodlights, spreading illumination over 90 degrees or more. (Lumishore has a configurator page to help with this.) Some companies offer only a couple of colors—blue and white are most popular—while others can give you the whole spectrum. Some lights mount externally, on the hull surface, with simple fasteners, while others live in bronze or polycarbonate housings installed into the hull, similar to water-intake through-hulls but sealed on the outside with a lens. 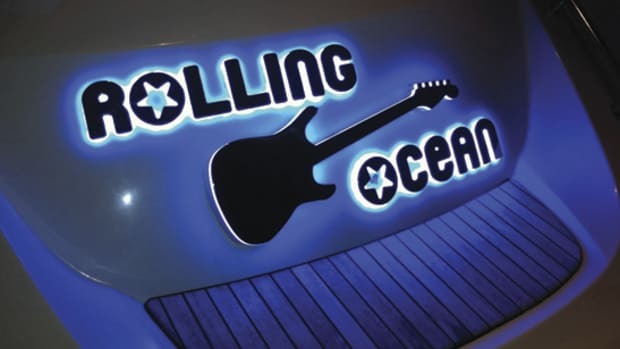 Decide what light pattern you want, then home in on specifics: number and output of lights you’ll need (bigger boats need more lumens), beam widths, color, and surface mount or through-hull. 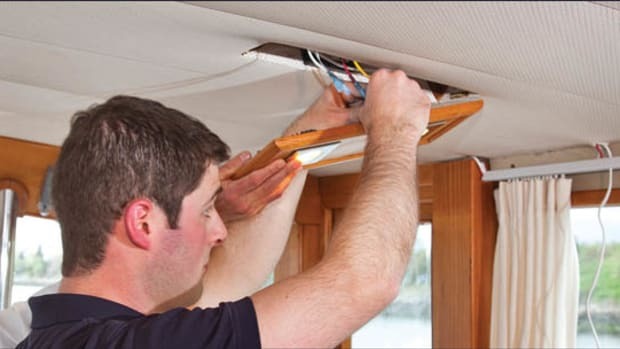 Surface-mount lights are easier to install, by the way, but some can be mounted only on the transom, not on a running surface. 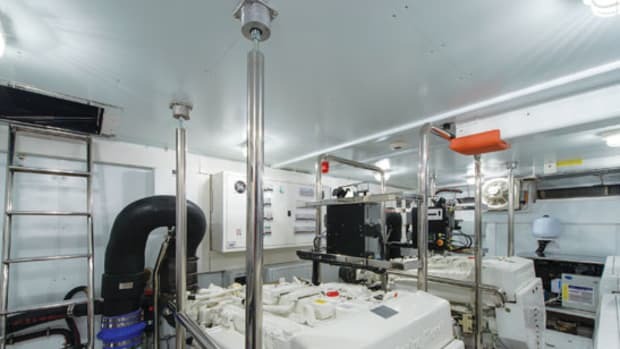 Don’t ignore other mechanical issues either (flat surfaces for mounting the lights, access to the inside of the hull, difficulty of wiring, etc.) and, finally, don’t forget your budget. 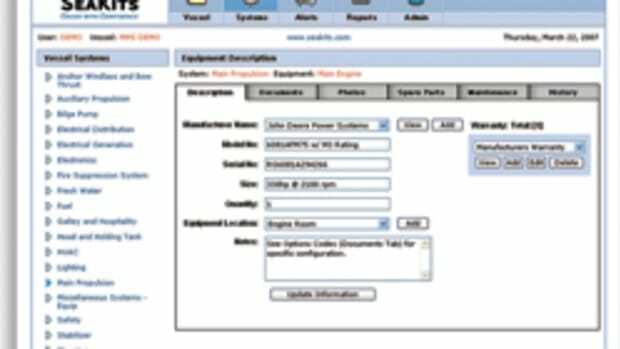 Before ordering any lights, download the installation manual from the company Web site to see what you’re signing on for. Surface-mount lights require only a small hole for the necessary wiring to pass through, and three or four other holes for fasteners. If you’re mounting lights in a cored section of the hull (most transoms are cored, even if the rest of the boat isn’t), take extra care to keep water out of the holes. Bed the light in an adhesive—most manufacturers recommend 3M 4200. The adhesive really holds the light on; the fasteners clamp it in place until the glue sets. Put extra adhesive around the wire and the screw holes, and ensure the goop squeezes out all around the light as you tighten the fastenings—don’t crank on them too hard. Masking around the perimeter of the light (and around the base of the light itself) will make a neater job when you wipe off the excess adhesive and remove the tape. 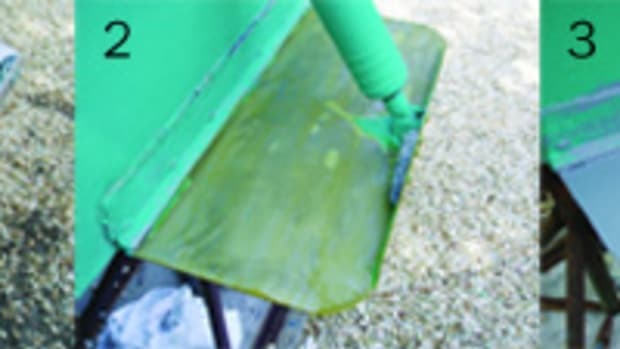 Finally, squirt sealant into the wiring holes from inside the boat, too, to keep moisture from seeping into the core through the back door. Macris Industries has a unique way of attaching their MIU Series lights to the hull: Instead of fasteners through the body of the light, which can create stresses in the composite polymer, and crack it if the screws are overtightened, company President Harrison Macris devised carbon-fiber clamps that mount to the hull with adhesive and mechanical fasteners. There’s a clamp at each end of the light, which “floats” between the clamps on a bed of 4200. These low-drag lights are less than a third of an inch thick and can be mounted “almost anywhere on the boat,” according to Macris. 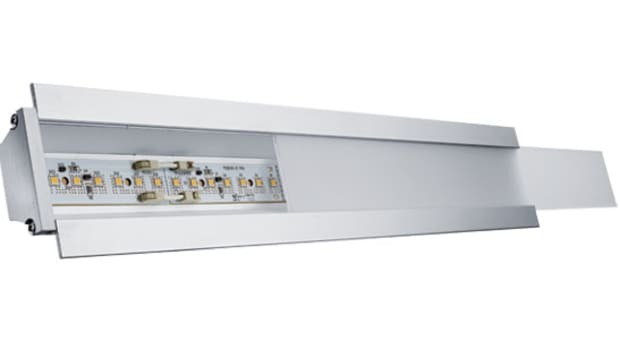 MIU Series lights are made from polycarbonate billets machined on the back side to fit the LEDs and associated components; the front of the billet is laminated with a hard, slippery polymer surface that resists scratching and marine growth. Maybe one color is not enough for you. Lumishore Surface-Mount Color Change lights use a combination of red, green, blue, and white LEDs to produce the full color spectrum in each light’s output. Using a control unit, the skipper can select a preset color, or let the LEDs run through the whole rainbow. 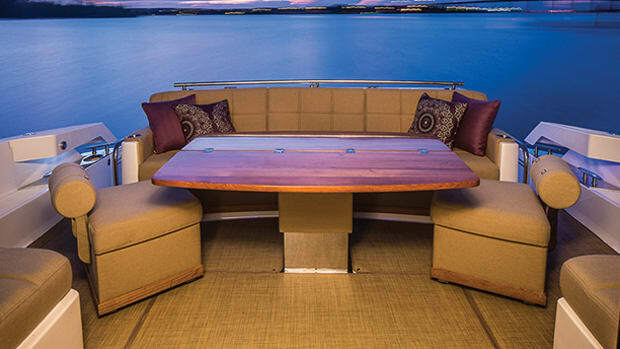 Connect the yacht’s sound system and the lights become a disco inferno, changing colors to the beat of the music. Macris Industries’ MIU Chroma lights (they’ll be available this summer) use what the manufacturer calls Dynamic Pixel Control to create a similarly outrageous light show. Each LED in a Chroma light can change color, controlled by a mini-computer that, in turn, takes its instructions via a smartphone. The Chroma light can change colors randomly, do a “wave” through the color spectrum or, by daisy-chaining multiple lights, turn the stern of your vessel into a Star Wars-worthy light show. It’s a long way from simply luring a fish onto the hook. And hey, the dockside dollies won’t be able to resist.